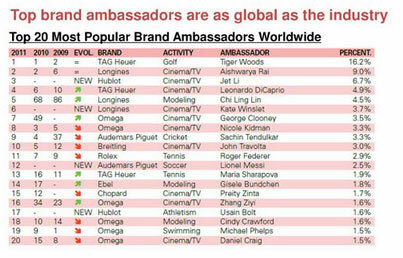 Former Miss World of 1994, Aishwarya Rai from India ranked 2nd at the Top 20 Most Popular Brand Ambassadors Worldwide list which was reported last March 8. The recent survey was done by an international marketing research company for luxury watches. The popular American professional golfer, Tiger Woods leading the top of the list with 16.2% votes followed by the Bollywood Indian Actress who received garnered 9% over all votes.